ASL 9 - Gung Ho! You've fought on the Eastern and Western fronts, in the Mediterranean and North African theaters, on the plains of Manchuria and in the jungles of Burma and New Guinea. You've experienced paradrops, glider-borne landings, Stuka attacks and opposed river crossings. Only one major type of WW2 land combat remains unexplored: the classic amphibious assault. 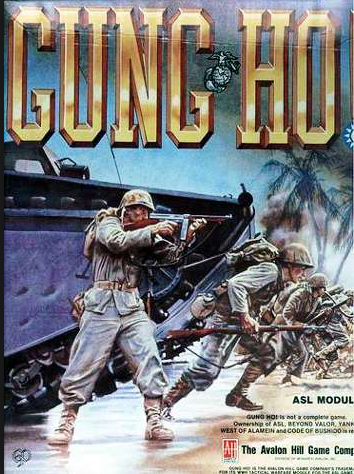 Now, in GUNG HO!, this too is added to the combat repertoire of ASL. And what better way to present assault landings than with the introduction of the U.S.Marines. GUNG HO! offers four types of U.S.M.C. squads, reflecting their evolution through the war years, along with the most comprehensive tactical-level amphibious assault rules ever offered in a wargame. It is all here in the balance of Chapter G: deep and shallow ocean, beaches of variable width and slope, sea walls, piers, beach obstacles, reefs, heavy surf, naval gunfire, and all the important types of landing craft used by the Allies and Japan throughout the war. As if this weren't enough, GUNG HO! also introduces rules and counters for the infamous cave defenses employed by the Japanese, plus new infantry counters for the early U.S. Army in the Phillipines and the entire order of battle of the Chinese Army. Last but not least, two new mapboards, several sheets of overlays and eight scenarios are included.